One year my Uncle Kenny brought this fantastic bread to Christmas at my house. He brought two loaves and good thing too because my youngest discovered it early in the evening and I swear he ate one whole loaf! Make sure that you read the packaging on your frozen bread loaf, what I have done is placed my loaf in a baking dish lightly spread olive oil over the bread, place a clean kitchen towel over the pan and let it rise over night. Flour your work space and rolling pin, next roll out your thawed bread try to get it 12x12 inches or as large as you can without it being torn or to thin. Now brush the dough with the oil, sprinkle with the seasonings. Next sprinkle with cheese's and then the pepperonis. 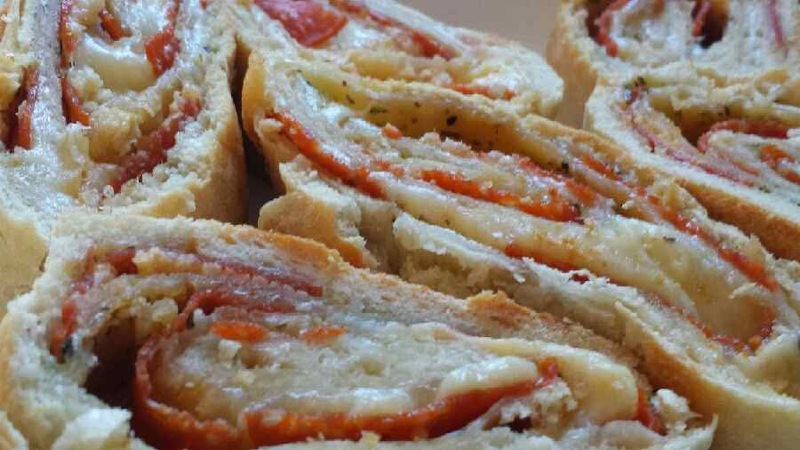 Roll your pepperoni bread as tight as you can until the ends meet now pinch the end shut so there is a seal. Brush the edges with egg to make a good seal. Place on a baking sheet, bake for 40 minutes. You may want to dip Pepperonis into a marinara sauce.